Earl Scruggs is considered THE MASTER of the five-string banjo. Murphy has studied Earl's picking closely for over twenty years. She not only can play the Scruggs style herself, SHE CAN TEACH IT! Here are five of Earl's greatest tunes, carefully explained note-by-note as only Murphy can do it. Sally Goodwin, Groundspeed, Pike County Breakdown, Bugle Call Rag,and Foggy Mountain Special. 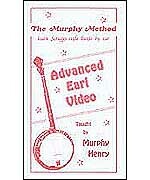 It's the longest banjo video on the market! 2 hours and 21 minutes! No Tab. It's all taught BY EAR, one lick at a time.